Apple isn't the first company to make a wireless smart speaker: a gadget that connects wirelessly to your digital devices and smart home to answer questions, play music, turn on the lights and lots more. And not being first to market means Apple's HomePod faces stiff competition from Amazon Echo, Google Home, and later this year high-end Sonos speakers will come with Amazon's Alexa voice assistant, putting them head-to-head with Homepod, too. With Apple pricing the HomePod for $349, it's a tough sell compared to the $179 Amazon Echo or the $129 Google Home. But HomePod is the only one of these to offer Siri and integration with Apple's HomeKit smart home system. And, if you have a speaker that supports Apple AirPlay or an Apple TV, you may be able to upgrade to AirPlay 2 so you can use your HomePod and all your AirPlay 2 devices together as a whole-home system. Is that, plus some high-quality sound, enough to make this smart speaker worth the price? Let's run through its features and see. 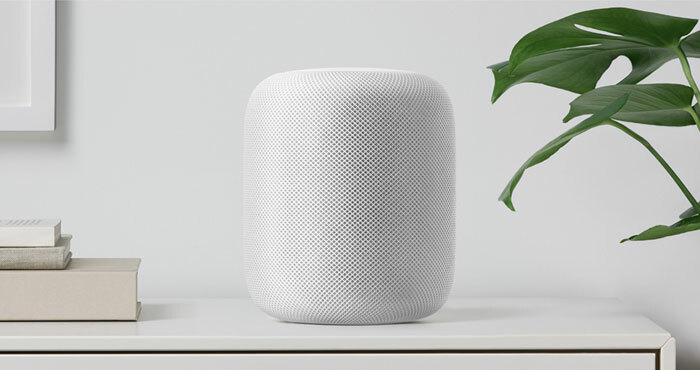 Sound-wise, HomePod bests both the Echo and the Home, which makes it a good choice if you want a high-end speaker in addition to a voice assistant. It has a 4-inch woofer with a custom amplifier as well as seven beamform tweeters, each with individual drivers. In layman's terms, that means it has deep bass and sound that can send crisp sound in every direction. Apple takes a step beyond basic speaker hardware, though. This is sound with smarts: HomePod can sense the size and shape of the room it’s in and tune the music to be just right. Whether you put the speaker in an out of the way corner or in the middle of the kitchen table, it will deliver perfectly balanced sound. Six microphones in the speaker's base — one less than the Echo but four more than the Home — let HomePod pick up your requests from across the room (even with loud music playing). Just say "Hey Siri," and Siri will help you out with whatever you need. Siri can do everything you'd expect, like setting timers and playing music, but Siri is smarter now, especially where music is concerned. Ask her to play something new or play more like what you're listening to, and Siri will happily oblige. Unfortunately, Siri is tied to Apple Music, which means that Spotify and Amazon Prime Music aren't available (at least for now). That's not likely to be a dealbreaker for Apple fans, who will appreciate the fact that this is the only smart speaker to support Apple Music. But if that's a problem for you, the Echo or Home may be better smart speaker choices. Still, Siri's most appealing feature may be privacy protection. Both Google and Amazon's voice control systems record a few seconds before and after you call on them — and save those recordings online until you delete them. Siri doesn't record anything until after you say "Hey Siri." After that point, it gives your request an anonymous ID and encrypts it before sending it to Apple to get a response. That means no one — not even Apple — can keep track of what you're doing. Smart home features are another big focus for other smart speakers, and this will be the first such speaker to support Apple HomeKit. The number of smart home devices you can control with HomeKit is far fewer than that you can control with Amazon's Echo — but if you want a smart home that works with Siri, HomePod and HomeKit are your only options. Whether or not that's a selling point is up to you to decide. Fortunately, you have plenty of time to make up your mind about the HomePod. It will be available this December in either white or space gray. It's not available for pre-order yet, but when it is, it will set you back $349. Time will tell but at $350 and with weak AI just do NOT see this being successful. Apple last speaker was also $350 and lasted on the market for 18 months before pulled because of weak sales. This is why the Echo has commands you memorize and the GH you just talk to it like a human. So if do not know the song name with music the Echo has a command of “Song goes like” that you memorize. Working on DIY project in daughters room and telling me about Ed Sheeran performance at the Grammys the night before and she says “hey google play sheeran grammys” and it plays. Our Echo was always my toy and the GHs get used by everyone I suspect because of the lower friction that there is nothing to memorize to use. You plug it in and just talk to it like a person. BTW, everything is like this with the Echo versus the GH. So when I talk to the GH it knows me and gives me my stuff. It knows by the sound of my voice. I get YT Red for my music for example. Wife talks to the GH and gets her Spotify account. The Echo instead has a command you memorize and tell the device to switch accounts. For security the Echo uses a passcode versus no need on the GH.